Enabling Traders By Producing Optimal Flow! Our logic was simple: if traders had better information and better visibility into their markets then they could make better decisions. AlphaReveal: Advanced DOM & Orderflow Monitor provides instant insight into the both the limit order imbalances and order flow imbalances that drive price. Attempting to trade with traditional time/sales, DOM, and charting is like trading in the dark compared to the Total Illumination that AlphaReveal provides. AlphaReveal's OrderFlow Bars™ enables the trader to see inside traditional time, range, and volume bars to see both the intensity of the buying and selling and the overall amount of activity. OrderFlow Bars™ make it easy to read the order flow and can be painted in both histogram and heat map styles. OrderFlow Bars can render the the total volume that trades inside a bar, the difference volume (buying-selling), bid vs ask (buys vs sells), total volume with difference shading (a favorite), and our personal favorite PressureVolume™ style which is our (dash)-(pos. difference) style. It is also easy to highlight the High Volume or HV nodes for each bar. We combined the resting limit buy and sell orders into a single view in AlphaReveal. NinjaTrader only shows a small portion of the available depth: we show show you everything your broker provides. We also render the depth in a visual form which makes it easy to see relationships that would otherwise be impossible. But, we go a step beyond in that we highlight the statistical mode (or the highest volume concentration) for both the resting sell and buy orders. We've found movements in the modes to often be a leading indicator of order flow change. One of our goals with AlphaReveal was to surface the best quality information to the trader while filtering the noise. As such, the resting orders can be displayed in a numberless form which makes it easy to see the relationships and track the mode without any numbers! Our OrderFlow Bars can be rendered sans numbers, as well. The Most Advanced And Easiest Method Ever Invented To Read The Tape! It is not just an imbalance in buying or selling that leads to directional price movement but rather one sided order flow over a short burst of time makes for the best directional price movements. Our PressureVolume™ display is the best way to read this directional order flow. We make it easy because we highlight whether the bid or ask is receiving more volume, and then we also show how much more volume the bid or ask price is receiving. On the opposite side, we simply print a dash. We accumulate the volume into a single cell to make it a breeze to read. Our monitoring system knows when the market trades at a new price and automatically resets its counting which makes it possible to see how the order flow is responding to new prices in real-time. Our OrderFlow Monitor is excellent for seeing the algorithmic and high frequency algorithmic activity that often dominates today's markets. Our OrderFlow Monitor is absolutely superior to Time & Sales while still persevering a "close to the metal" approach the order flow which is great for developing intuitive flow and insight. Our signature PressureVolume™ style is just one of 3 styles we have for rendering this information! Tracking OrderBook Imbalances That Often Lead To Order Flow Reversals! We've found that orderbook imbalances often lead to order flow reversals. We know of no other software that enables traders to see these orderbook imbalances except ours! Our LimitResistance™ display makes it easy to see the imbalance in the orderbook because we highlight these imbalances with simple color coding. We subtract the Resting Sell Orders from the Resting Buy Orders based on user customized options and then we surface that data to the trader in real-time. A large positive number indicates a strong buy-side imbalance and these buy-side imbalances often can lead to order flow reversals. Likewise, a large negative number indicates a sell-side imbalance and can lead to retracements. It it easy to track because we enable user-defined thresholds which color highlights extremes. Light blue indicates there is an extreme imbalance of buy-side resting limit orders to sell-side resting limit orders while light pink tells us there are relatively more sell-side resting limit orders. Our Volume Accumulator enables the tracking of both the volume and order flow from any price level or time that the trader feels is important. This tracking feature encourages the trader to take a pro-active approach to monitoring the order flow while, also, enabling tracking the inventory or sentiment from significant levels such as order entries, pre-planned trade levels, or specific times. The trader can render this information in multiple side-by-side displays using all the styles found in our OrderFlow Bars™ . Long term volume histograms can show areas of significant interest and importance. Our software can build tick accurate volume based histograms using user-defined session data and over the number of days specified. For example, you can build a 24 hour histogram or build a histogram that excludes the overnight globex data. Utilize our ability to Paint On DOM™ to mark and highlight areas of interest. Significantly Improves Time & Sales With Advanced Algorithms & Expanded Functionality! Our QuantTape advanced time& sales is a powerful upgrade over traditional time & sales displays. Due to changes in trade reporting and high frequency trading, traditional time & sales displays have became very difficult to read because the orders scroll off the screen at a rate too fast for the trader to read. Our Time & Sales Inspector can display the incoming orders in 5 different styles determined by our proprietary algorithms. Consolidated mode aggregates the order flow hitting the bid or ask side which reduces the scrolling and allows the trader to get a better impression of the actual volume that is hitting the market. This algorithm is a major improvement over the simple readout but we take it to the next level using our advanced "Levels" algorithm. 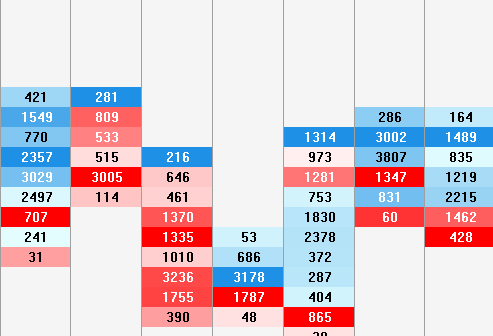 The Levels mode tracks the volume on a 2 sided basis and aggregates orders that come in on the same price level. This provides for a historical readout of the same or similar information that is displayed in the OrderFlow Monitor. The effect is to slow down the speed of the tape to the same rate that the market ticks up or down while still preserving the "look & feel" and information found in traditional tape. Our Time & Sales display also features a "freeze" mode which allows the trader to freeze the tape for inspection, allows full scroll back to the beginning of recording, and even the ability to select & automatically sum rows. Also, supported is the ability to display "right most" (least significant digits). HighSpeed Market Replays, Simulated Trading, And So Much More! Our Software Supports NinjaTrader's Replay Feature Including High Speed Playback! We took extreme measures, more typically employed in video game software, to ensure that our software was fast enough to handle even high speed NinjaTrader playbacks -- and it does so brilliantly. This Market Replay feature enables the users of our software to download free replay data from NinjaTrader's servers, review, replay, and even sim trade using our software without having to risk a dime in the live markets. The ability to both replay data into our software and sim trade on the same synchronized data using the NinjaTrader SuperDOM is a most-powerful combination! Likewise, you can use any NinjaTrader supported datafeed to power our software, although we recommend high quality feeds such Kinetic and IQFEED. Our software benefits from the synergistic combination of orderbook illumination and order flow visualization. Sign up today and see for yourself!